A French-born jihadist who spent a year fighting in Syria for the Islamic State (IS) group has been found guilty of the murder of four people in an anti-Semitic attack in Brussels in May 2014. Mehdi Nemmouche, 33, opened fire with a Kalashnikov assault rifle and a handgun at the city's Jewish Museum. Three people died at the scene and one died later in hospital. A man who helped plan the attack and provided the weapons, Nacer Bendrer, was also found guilty of murder. Sentencing will be announced at a later date. The two-month-long trial involved apparent witness intimidation and testimony from former prisoners of IS in Syria. Two Israeli tourists, a volunteer worker and a receptionist were killed in the attack on the museum. Nemmouche's lawyers tried to suggest that he'd been framed in an elaborate conspiracy which blamed the murders on foreign intelligence agencies, but produced no evidence to support the claim. He is believed by Belgian prosecutors to be the first European jihadist to return from the battlefields of Syria to carry out terror attacks in Europe. He was born into a family of Algerian origin in the northern French town of Roubaix. He was previously known to French authorities, having served five years in prison for robbery. He is said to have met Bendrer while in prison. He travelled to Syria in 2013 and stayed for one year, during which time he is believed to have fought for a jihadist group in the country's civil war. Four French people held hostage in Syria allege they were guarded by both Laachraoui and Nemmouche during their captivity. 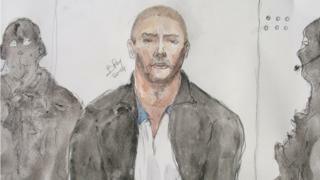 Nemmouche was extradited to Belgium to face charges connected to the museum shooting, but may also face trial in France over the allegations he was involved in the French prisoner's captivity. The trial was dramatic from the outset. Security was put in place to match that of the trial of jailed jihadist Salah Abdeslam, the sole surviving member of the 2015 Paris attackers. Days after it began, a lawyer representing a witness reported his laptop and some paperwork on the case had been stolen from his office. A baseball bat and replica gun were left in their place – something prosecutors viewed as a threat. In the dock the next day, Nemmouche denounced the attempt at intimidation - and the witness, 81-year-old Chilean artist Clara Billeke Villalobos, went on to testify anyway. Next came the orphaned daughters of Miriam and Emmanuel Riva, tourists from Israel who were killed in the attack. The couple had been celebrating their 18th wedding anniversary. Ayalet, 19, and Shira, 21, described a mother "devoted to her family" and an unassuming father who "loved to travel". Three weeks into proceedings, jurors were shown video of Nemmouche in custody after his arrest. Belgian newspaper Le Soir described it as showing an "arrogant" Nemmouche in front of police with a "disdainful smile", arms folded. He repeats his right to remain silent again and again. Four French journalists were kidnapped in June 2013 and held hostage by the IS group in the northern city of Aleppo until April 2014. Two of them appeared in court - pointing out Nemmouche as their captor. Nicolas Henin told the court Nemmouche was "sadistic, playful and narcissistic", while Didier Francois said Nemmouche had beaten him dozens of times with a truncheon. Their kidnapping is the subject of separate proceedings in France. By the end of February, prosecutor Bernard Michel was ready to sum up his case and demand a guilty verdict. He told the court Nemmouche was "not simply radicalised but ultra-radicalised". "If attacking a museum with a combat weapon is not violent and savage then nothing will ever be violent and savage," he said. "We are looking at one of the most serious possible crimes." "For the killer, for Mehdi Nemmouche, the identity of the victims mattered little," he added. "The aim was simply that there should be victims. Everything was premeditated." The closing argument from the defence was described by some as "mind-boggling", as it wove a web of conspiracy involving foreign intelligence agencies and assassination. Sebastien Courtoy, Nemmouche's lawyer, suggested that his client was recruited in Lebanon in January 2013 by Iranian or Lebanese intelligence to join the ranks of IS. But this claim went unsubstantiated. According to Mr Courtoy, the murder was not an IS attack, but a "targeted execution of Mossad agents" - a reference to the Israeli intelligence agency, which he claimed the Israeli couple belonged to. The killing was carried out by an unknown person, he said. Yet judges investigating the museum attack last month told the court there was no evidence to support any link to Mossad. Mr Courtoy claimed that it was in this supposed double-agent capacity that Nemmouche was the jailer of the French journalists, though he claimed they were never mistreated. He said Nemmouche "went off the radar towards the end of 2013" after British jihadists suspected him of "engaging in double- dealing". Upon his return to Europe, he supposedly tried to quit the spy group, "which was simply trying to use him". At one pointed the defence even argued that Nemmouche could not be considered anti-Semitic because he wore Calvin Klein shoes - an apparent reference to Mr Klein's Jewish heritage. A lawyer representing a committee of Jewish organisations called that observation "mind-boggling and incoherent".